The species of wasps in Sydney that cause the most problems in commercial premises are European wasps (Vespula germanica) and mud wasps. If you own a small business they can be a real threat to employees and clients, especially when they walk into their flight paths. Most are passive, but once accidentally disturbed, they can be quite aggressive. 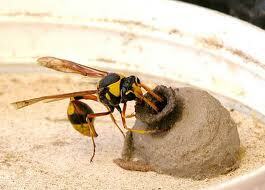 Potter wasps build mud nests with individual chambers and put a caterpillar in each for the wasp larvae to consume. These wasps do sometimes build their mud nests of the side of homes but they aren’t particularly aggressive and they’re solitary in nature so you won’t find swarms of these wasps together. The best time to remove a Potter wasp nest is after the holes appear as that’s an indication that the larvae have become adult wasps and departed. Paper wasps are a little more social and a bit more aggressive. They too sometimes establish their nests on a house however their nests are constructed of wood fibres and saliva and look a little bit like paper Mache. They have many little cells where the larvae are deposited and fed until maturity. Paper wasps often suspend these nests from eaves. They may attack if you approach or disturb the nest. These pest wasps are found mainly in Europe, the USA, Argentina, Chile, Australia, in both the North and South Islands of New Zealand. It a prolific pest that has been introduced to Australia. In the United States, they are referred to as “Yellow Jackets. The worst thing is that European wasps are able to sting you more than once and they have been known to cause fatalities to people that are allergic to them. multiple times, making them a significant danger for those who may be allergic to wasp stings and an unpleasant and painful experience for those who aren’t. Nests are usually out of view and don’t need to be very close to your home for the occupants to be a problem – these wasps venture a good distance from their nests in search of food. And what are their favourite foods? They like meat and have a sweet tooth so fruit that has fallen from trees, uneaten pet food, soft drink glasses or bottles left outdoors, and sweet treats in an uncovered rubbish bin can attract these wasps. If you have a problem with aggressive wasps near your home, call in a pest control expert. European wasp nests often contain large numbers of wasps and when a nest is disturbed it may result in multiple wasp attacks.